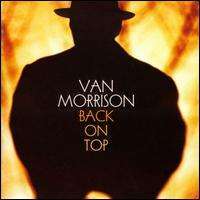 Back on Top is the twenty-seventh studio album by Northern Irish singer/songwriter Van Morrison. It was released in 1999 by Point Blank. This album marks a slight return to the forms of music he is most known for: blues and R&B. Upon the album's release, Rolling Stone reviewed it as "one Monet and nine Norman Rockwells", the "Monet" being "When the Leaves Come Falling Down" which it called a masterpiece. The 29 January 2008 reissued and remastered version of the album contains an alternative take of "Philosopher's Stone" and a new arrangement of Fats Domino's song, "Valley of Tears". Recorded at the Wool Hall Studios, south of Bath, England, except strings, which were recorded at Windmill Lane Studios, Dublin, Ireland. The musicians on the album are understated with Ian Jennings playing double bass, Geraint Watkins playing Hammond organ and Pee Wee Ellis on saxophones. The opening song "Goin' Down Geneva", a very blues influenced tune, is set in European cities instead of the American South as typical for blues songs. "In the Midnight" is referred to by Allmusic as "bedroom music, pure and simple." "Back on Top", the title track, is an optimistic statement of the singer's outlook and may be a view of his personal relationships or professional standing. "When the Leaves Come Falling Down" is a ballad set in autumn and enhanced by a string section. A highlight of "High Summer" is Morrison's harmonica. The lyrics are evocative of religious imagery in referring to "Lucifer" and "God" and return to his 1960s songs for mentions of "red sport cars" and "mansions on the hill". The ballad of lost love and heartbreak, "Reminds Me of You" was written in 1996 after a break-up of his engagement to Michelle Rocca and was not recorded for three years during which time they had reunited. "New Biography" was inspired by Brian Hinton's biography, Celtic Crossroads, written in 1996. The song's lyrics voice Morrison's complaints of celebrity and "books about his life and more precisely 'so-called friends' who chose to spill inside information and memories to biographers." "Precious Time" has since become an often performed concert tune for Morrison with very meaningful lyrics about the quick passing of time and the need to enjoy life while we can; "It doesn’t matter to which God you pray/Precious time is slipping away." Another song with a fall setting, "Golden Autumn Day" is about being mugged in an unnamed city in Britain. The video for the song "Back on Top", received significant airplay on the Canadian music station, "MuchMoreMusic", when it was released. Performances of "Back on Top" and "When the Leaves Come Falling Down" from Back on Top along with "Gloria" were televised as part of Later... with Jools Holland on 16 April 1999. The album had mixed reviews from critics but charted higher in the US than any of his albums since Wavelength. It went gold in both the US and UK. Allmusic rated it four stars with reviewer James Crispell noting: "After so many songs ranging through so many styles, it is a pleasure to have Van Morrison return to the music that suits him so well. Steeped in blues and R&B, Back on Top finds Morrison celebrating life and its pleasures to the limit." It was rated 3 stars by Rolling Stone with James Hunter ending his review commenting: "Back on Top is solid, brilliant, silly in sad ways. But it's still one Monet and nine Norman Rockwells." Irish critic George Byrne wrote a negative review in the Irish Independent: "Somewhere in the mid-Eighties the poet/philosopher accolades seem to have seeped into his skull and he began churning out same-sounding albums on an almost annual basis." An opposing viewpoint was expressed by George Graham who commented in his review that "It's one of his best, most tasteful albums in recent years, and Van Morrison has had some very good albums in this period." The photograph of Morrison on the inside of the album cover, was originally used for the front cover of Peter Handke's book My Year in the No-Man's-Bay, first published in 1994. All songs by Van Morrison, unless otherwise noted. 1 2 3 Hunter, James (1999-04-01). "Rolling Stone review: Back on Top". rollingstone.com. Retrieved 2008-12-05. 1 2 3 4 Graham, George (1999-03-18). "Van Morrison: Back on Top by George Graham". georgegraham.com. Retrieved 2009-09-03. ↑ Hage, The Words and Music of Van Morrison, p.128. 1 2 3 4 "Allmusic review: Back on Top". allmusic.com. Retrieved 2010-01-12. ↑ "Dr. Brian Hinton". thewordtravels.com. Retrieved 2009-11-12. ↑ Hage, The Words and Music of Van Morrison, p.127. ↑ "concerts". van.vanomatic.de. Archived from the original on 14 September 2008. Retrieved 2008-08-29. ↑ "Back on Top review". ew.com. 1999-03-12. Retrieved 2010-01-12. ↑ "RIAA Gold and Platinum". riaa.com. Retrieved 2010-01-12. ↑ "Album artist 58-Van Morrison". tsort.info. Retrieved 2012-12-30. ↑ Rogan, No Surrender, p.453. ↑ Chart Stats: Van Morrison Archived 26 September 2012 at the Wayback Machine.